Disclaimer: While I usually scan the sheets of paper for my ink reviews, these images are coming right out of my iPhone. That explains the inconsistencies in color and quality. Second Disclaimer: I realize that this post flies in the face of what I said last week about putting up with some other things as long as the color and saturation are there. What can I say? I'm fickle. If you've been in the fountain pen community for any length of time, you have probably heard of Noodler's Baystate Blue. Famous for it's amazing color and it's amazing ability to stain (or even ruin?) your most loved pens. 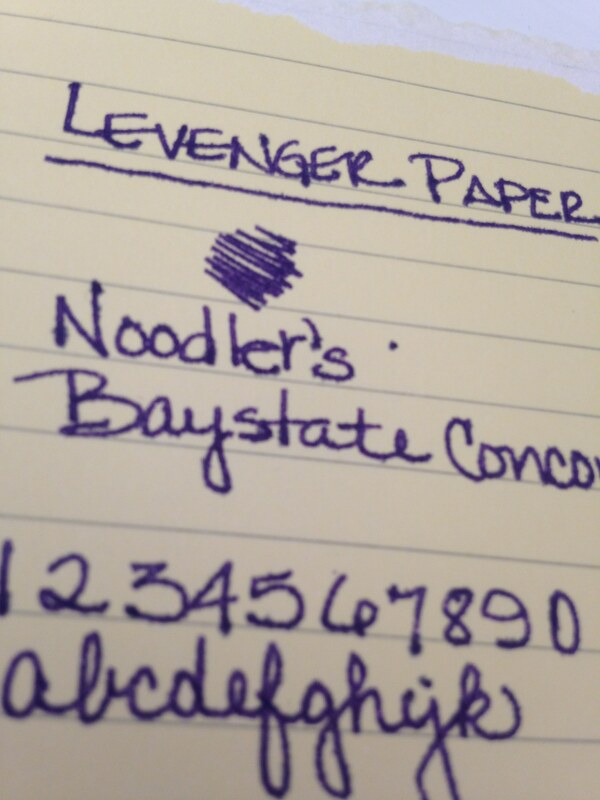 But Blue isn't the only Baystate color from Noodler's. There is Concord Grape and also Cranberry. 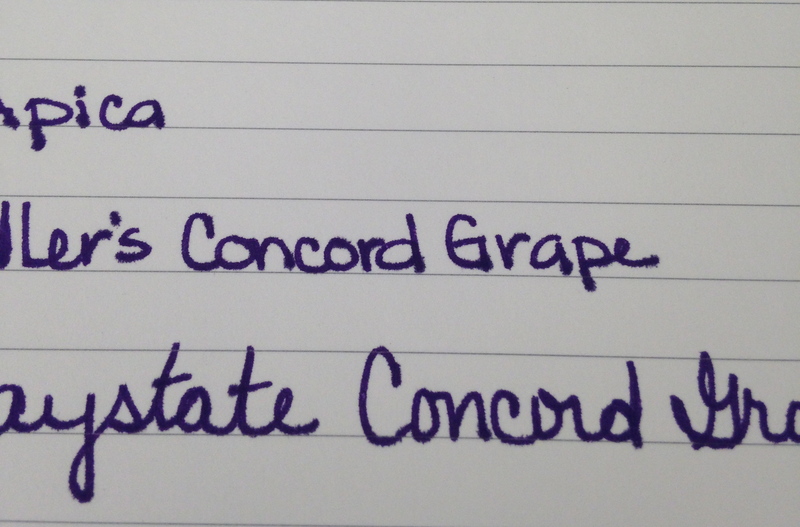 Today, we discuss Concord Grape. The color is what I expected - very saturated, very purple. No complaints there. It's the feathering. Click on the images to see the full-size or have a look at these screenshots from the original images. If it was just one paper (especially the Levenger, which has been questionable with a number of inks), I could let it go. The color is so great that a problem here or there is ok with me, but this ink was a problem on almost every paper I used. 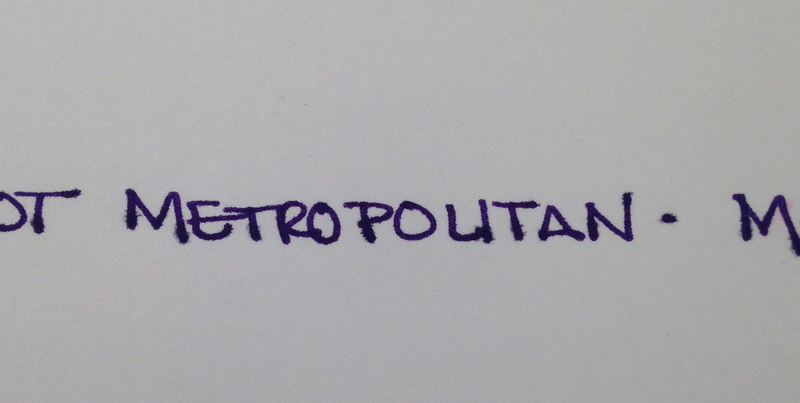 I was using a Pilot Metropolitan (medium nib). It's a pen I'm very familiar with and have had no problems with in the past. After the ink sat in this pen for a day or so, the flow was terrible - I eventually had to open the pen and give the squeezie converter thing a little squeeze to get things flowing again. With most of my ink reviews, I use the ink regularly for an entire week before posting. I was only a few days into the week before I realized that I wasn't reaching for this ink at all. It was making a mess out of my work notebook (a Rhodia) with all of its ugly feathering. Now, of course, your mileage may vary and I'm no expert in pens and inks (just love me some pretty colors and shiny things). 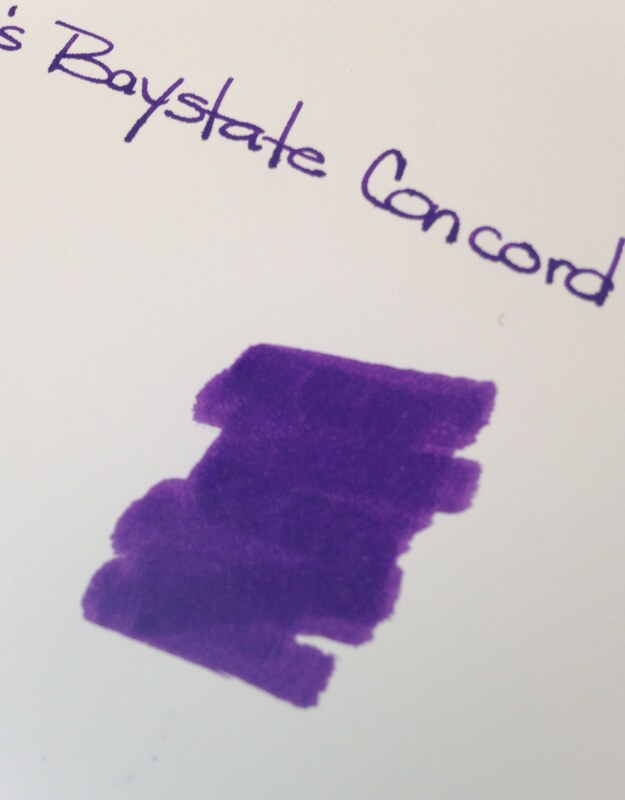 If you've tried Baystate Concord Grape, I would love to hear about your experiences. Also tried this ink - it is very intense in colour and I quite like it - BUT - it does bleed through. It stained the converter - and much worse it destroyed the feed on my Lamy Studio. I am going to try it again but with a cheap Jinhao pen.